Android Lollipop 5.0 vs iOS 8: Which is best? As Android is open sourced, there are hundreds of devices to choose from. All major manufacturers - including Asus, LG, HTC, Sony, Samsung and Motorola - offer handsets with varying screen sizes and specifications. This wealth of choice means there's an Android device available for all budgets and tastes. Android is designed to be customisable. Pick how many homescreens you want, change the themes and install widgets if you want a snapshot of emails or social networking messages. Don't like the look of the default interface or the keyboard? Simply pop over to the Google Play Store and install a third-party alternative. You can even make Android look like iOS or Windows Phone is you want. Experienced users can gain root level access to devices and flash the ROM with custom distributions such as CyanogenMod. 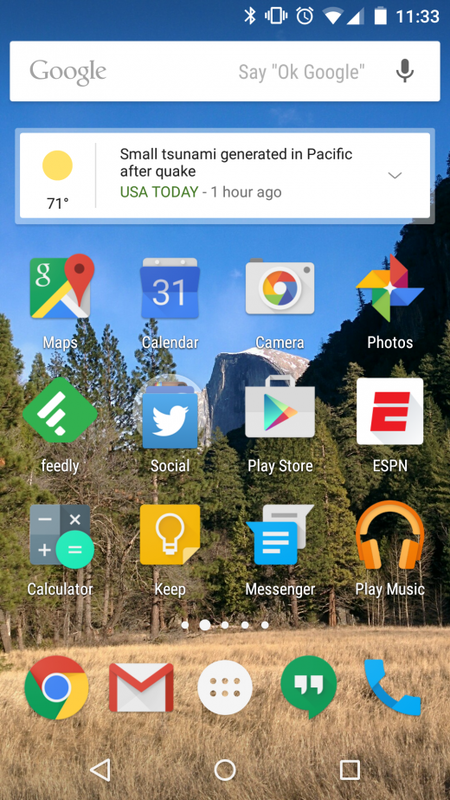 I've always preferred notifications on Android, and Google has made improvements with Lollipop. It's possible to view and respond to messages from the lock screen and set up priority notifications. Perhaps the best feature is the introduction of the heads-up display, which makes alerts less intrusive. When you're in an app and you receive a phone call, a pop-up appears so the caller ID doesn't take over your whole screen. Android devices generally have a notification light or screen pulse too, so you can immediately see if you've got messages when you've been away from the phone without having to pick it up. Many of the high-end Android devices have larger battery packs than their iOS rivals and when you factor in the battery saving options, they usually last longer. Handsets like the LG G3 and the Galaxy S5 allow you to swap out the battery by unclipping the back cover - ideal for power users. You're not restricted to using default Android apps to open files. If you find a third-party app you prefer to open photos or videos, for example, Android gives you the choice to use this. Google Now provides information cards about the weather, your favourite sports team, airport check-in times or how long it will take for you to get home from work. Meanwhile, Voice allows you to search your phone, the web, and nearby locations without typing. You can also call contacts and get directions by saying "OK Google" followed by the command. Transferring files from a Mac or PC to an Android handset is simple. All you have to do is plug in the device and it'll mount like a hard drive so you can drag and drop files. Many Android handsets feature micro SD support, allowing you to boost the internal storage of devices. Even if your device doesn't come with micro SD support, it's possible to buy an On-the-Go USB stick with micro USB connectivity or an adaptor for 64p so you can plug in any flash drive. Android is a target for hackers due to its widespread usage and because there is huge fragmentation. At the time of writing, nearly half (46 per cent) of Android users are still using Jelly Bean 4.x, which is two generation's old. Apps are not checked by Google before they are made available for purchase in the Play Store. Instead Google scans the store for malicious content, so it's easy for rogue apps to remain in the store. Whilst the issue of malware is a problem, using a common sense and avoiding apps from unknown developers and those with low star ratings should keep you safe. If it looks dodgy, then it probably is. However, issues are restricted to dodgy apps. The Android Browser had a critical flaw exposed in September 2014, which meant code could be injected into it that allows hackers to read cookies and grab keyboard inputs, such as passwords. Android 4.2.2 offered the ability to control the permissions of apps but this was subsequently removed. At present, you can see exactly what information your apps have but you can't restrict them. A particularly dodgy app we found was FM Radio, which gave itself permission to directly call phone numbers, and send text messages. Your only option with apps such as these is to delete them. If you own a Nexus or Google Play Edition handset, you'll be first in line to receive the yearly Android update. However, this isn't always a good thing as these early versions almost always introduce bugs and require a patch. If you buy a device on a contract, you have to wait for the networks to push out the updates. This process takes months but on the plus side you'll probably receive more stable code. Stick with the high-end handset and you'll have no problems. Issues are likely to become apparent if you invest in some of the low-end models with single core processors and 1GB of RAM or less. Apple is criticised for having a "walled-garden" approach but it's not as straight forward as it seems. Of course the firm pushes its proprietary services such as iCloud, iTunes and the App Store but you're not restricted to Apple's applications. Almost all of Google’s popular services - including Gmail, Maps, Hangouts, Now, Inbox, Chrome, Translate and Drive - are available on iOS. The Mail app in iOS is superb - allowing users to sync up multiple email accounts. It's got a unified inbox, and also allows you to set up VIP contacts and thread notifications as well as search by content type like attachments or flagged. Apple keeps tight control of the App Store with all submissions vetted before they are made available to the public. This means there are few instances of malware. iOS allows you to see what information apps have access to on your device and allows users to restrict them if they wish. Tighter privacy controls have been introduced in iOS 8. You can see exactly which apps have access to location data and you generally have three options when it comes to tracking. You can set access to "Always", "Never" or "While Using". You can turn off notifications and adverts that may pop up based on your location too. Initially rolled out to retail stores across the US, Apple Pay uses NFC so users can pay for purchases using either the iPhone 6 or 6 Plus. Payments are made in conjunction with Visa, Mastercard or American Express. Apple Pay is expected to arrive in the UK during 2015. Apple has started to allow users to customise their devices with iOS 8. Core APIs have been opened up to third-party developers to provide a better user experience. There's a long way to go before it reaches the level of Android. But at least users can now do the basics like swap out the default iOS keyboard for a third-party alternative, such as Swype or Swiftkey. Opening up APIs has meant the usefulness of Touch ID has been extended beyond unlocking the handset and paying for iTunes and App Store downloads. Touch ID now works with third-party apps including Amazon, eHarmony, Evernote Premium, LastPass and 1Password. Apple's personal assistant lets users talk to their phone much in the same way as Google Voice. You can ask Siri to set reminders, take notes, compose messages or for answers to general knowledge questions. Unlike Google Voice, you need to long-press the home button to initiate Siri. You can only use it completely hands-free when the iPhone is plugged into a power source via the phrase "Hey Siri". The Apple App Store is the first port of call for developers, so if an app is worth having, it's guaranteed to be available on iOS. Apple users generally get first access too. For example, Microsoft introduced its Office suite on the iPad before rolling it out to Android. 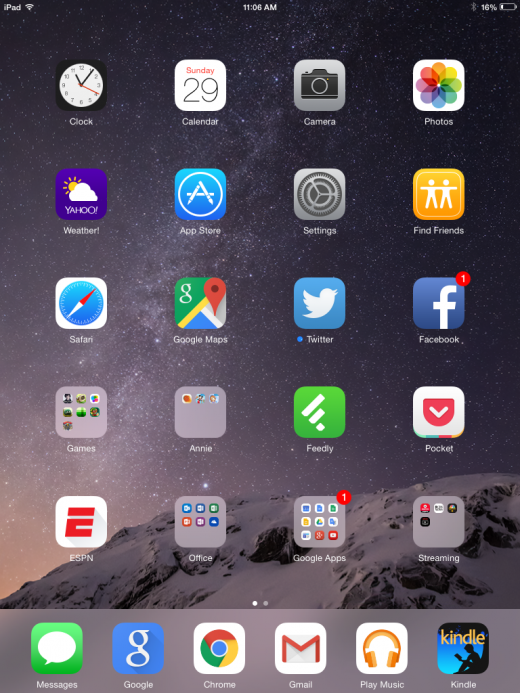 Apple has increased communication between iOS and OS X devices with the latest updates (iOS 8 and Yosemite). You can now make and receive calls on your Mac when it's connected to the same Wi-Fi network as your iPhone. It's also possible to see all your iMessages and respond to them as well as start using an app like Safari or Pages and continue where you left off when switching devices. Following the most recent update (iOS 8.2), iOS devices will be able to hook up wiht Apple Watch. At the time of writing, AppleWatch isn't genereally available, so the Apple Watch app (which cannot be uninstalled) will only open up a web page showing off the new wearable and not much else. When the watch is finally released, this will be updated to provide more detail on how iOS works with the devices. iOS isn't licensed out by Apple, so you're limited to four models: the iPhone 5c, 5s, 6 and 6 Plus. The 5c is the cheapest and available free on contract from £22.50 per month or £319 SIM-free. The iOS operating system doesn't offer multitasking or live widgets at this time, so if you're a fan of them, bear this in mind. There have been rumours that Apple plans to introduce these features, but so far nothing has been confirmed. Probably the most annoying thing for end users is the inability to expand physical storage. Apple has also axed the 32GB model with the release of the iPhone 6 and 6 Plus. The entry-level 16GB model is not going to be enough for most users, so this means you'll have to fork out for either the 64GB or 128GB model. There are a number of devices on the market that connect via the Lightening port to provide extra storage but is not as elegant a solution as being able to insert a MicroSD card into a slot. With the exception of iPhone 6 Plus users, anyone who's ever owned an iPhone has probably had to carry out a mid-afternoon charge ready for the commute home. We'd like to see bigger batteries and a manual power saving mode introduced to stop this. Getting files on and off your device can be fiddly, especially when they haven't been acquired via iTunes or the App Store. iPhones don't mount as a regular hard drive. You can only copy pictures off them when they are connected to a Mac or PC. There are ways around this using third-party tools, such as iSkySoft Tunesover, but using these programs interferes with how the device syncs with iTunes. Apple rolls out yearly iOS updates to everyone directly, so fragmentation is less of an issue on the platform (69 per cent are on iOS 8). However, as we've seen with iOS 8, it's best to wait until bugs are ironed out before installing the update, otherwise you can lose critical functionality. So which should you get? Android - Users on a budget will gravitate towards Android because devices are cheaper. But be careful because if you don't keep on top of privacy and security issues you could end up having your information compromised. At the high-end, Android devices offer more options for power users with the ability to fully customise the interface, use the device as a hard drive and swap out the battery. iOS - Generally suited to users for whom interface customisation isn't a priority, iOS is secure and has more privacy controls. It's ideal for those who want to mix and match services from Apple and Google - for example use iTunes and also have access to Google Maps on the same device.